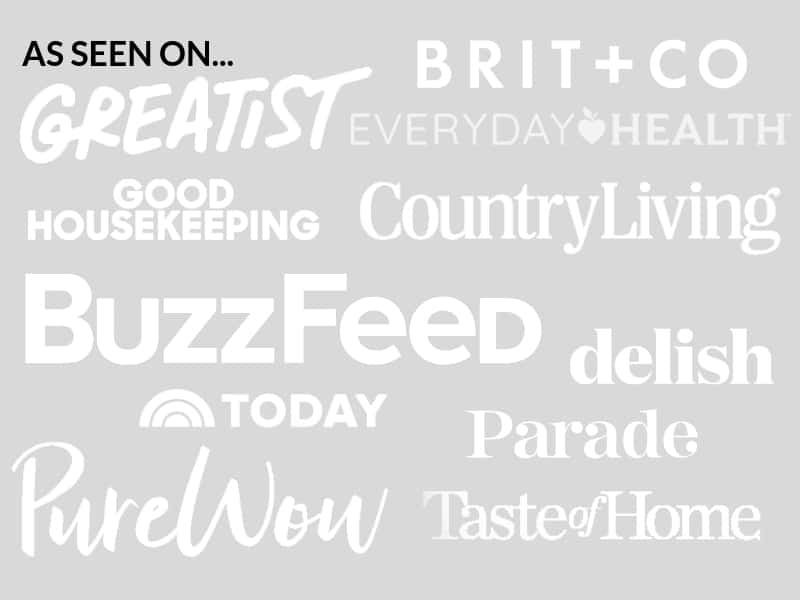 February 6, 2019 By Elizabeth Lindemann 4 Comments / This post may contain affiliate links. I just LOVE these simple Spinach and White Bean Patties served with cool, creamy yogurt sauce as an easy meatless meal. 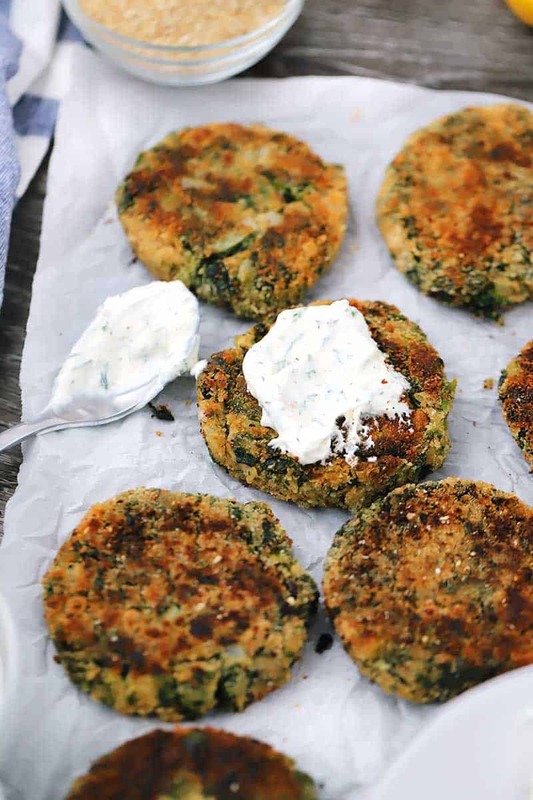 These veggie burgers are great with or without a bun! I think I’ve discovered the secret to feeding toddlers: put food in patty form. These spinach and white bean patties were born out of a need to get more iron in my children- both were just slightly under the desired amount at their last doctor’s visit. But they both don’t care for meat very much. Spinach and beans are both wonderful plant-based sources of iron, and guess what? Both my 2 year old and 9 month old gobbled up these veggie burgers in record time. Just mix together some canned white beans (drained and rinsed, of course) with some frozen spinach (drained and thawed), onion, garlic, and breadcrumbs, along with some salt and pepper. Then, form the mixture into 12 patties (or 6 to make more hearty veggie burgers) and coat in bread crumbs, then pan-fry in olive oil. So easy! And the yogurt mixture is SO good. It’s a simple mixture of Greek yogurt, fresh dill, lemon juice, salt, pepper, and extra-virgin olive oil. You can serve it as a dip for the patties or spread it on a bun if you want to serve this as a veggie burger. How do I keep the veggie burgers from falling apart? There are a few tricks to keeping these patties from falling apart, one of the most common problems with homemade veggie burgers. First, make sure the onions are very finely diced. If you doubt your dicing skills, you can even grate the onion on a box grater. The smaller all the components of the patty are, the easier all the ingredients will bind together and stay together. Second, make sure the spinach is as dry as possible. To thaw frozen spinach, I usually run hot water over it in a mesh sieve until it’s thawed out. Then, I press very firmly down with a wooden spoon, or sometimes my hands, to press as much water out as possible. If the spinach is too watery, the patties may be too sticky, hard to form, and fall apart easily. Finally, mash the beans. Not completely- you want to leave a few intact for texture. Just mash them in the bowl with a fork or a potato masher before adding the other ingredients. Should I bake or fry the veggie burgers? 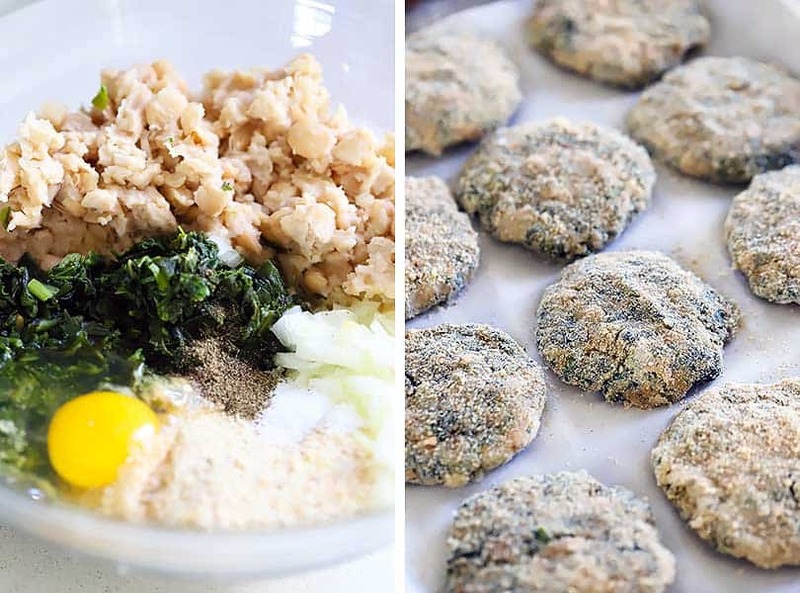 You can bake OR fry these white bean patties. I chose to fry them in a nonstick skillet, because I wanted a crispy golden crust on the exterior. I cooked them for 2 1/2 minutes on each side. But if you bake them, they will be a bit more firm, which is perfect if you plan on serving these on a bun. That way, they won’t smush out the side of the bun when you bite down on it. I recommend 375 degrees F for about 20 minutes. Want the best of both worlds? You can pan-fry the patties for a minute or so on each side, THEN bake them in the oven to finish them off. Viola! Yes! After cooking them, I recommend placing on a baking sheet and flash freezing them– freeze for about 30 minutes until they harden, then place them in an airtight container or zip-top bag. This will help them maintain their shape and not stick together. You can then heat them up in the oven, in a skillet, or in the microwave when you are ready to eat them. These would be great served on a bun spread with the yogurt sauce, topped with sliced red onion, tomatoes, and baby arugula. Or, they’re amazing topped with a poached or fried egg for brunch or brinner (I did this with the leftovers-yum!). You can make them smaller for a party appetizer or bigger for a more substantial veggie burger. Patties like this are so versatile! 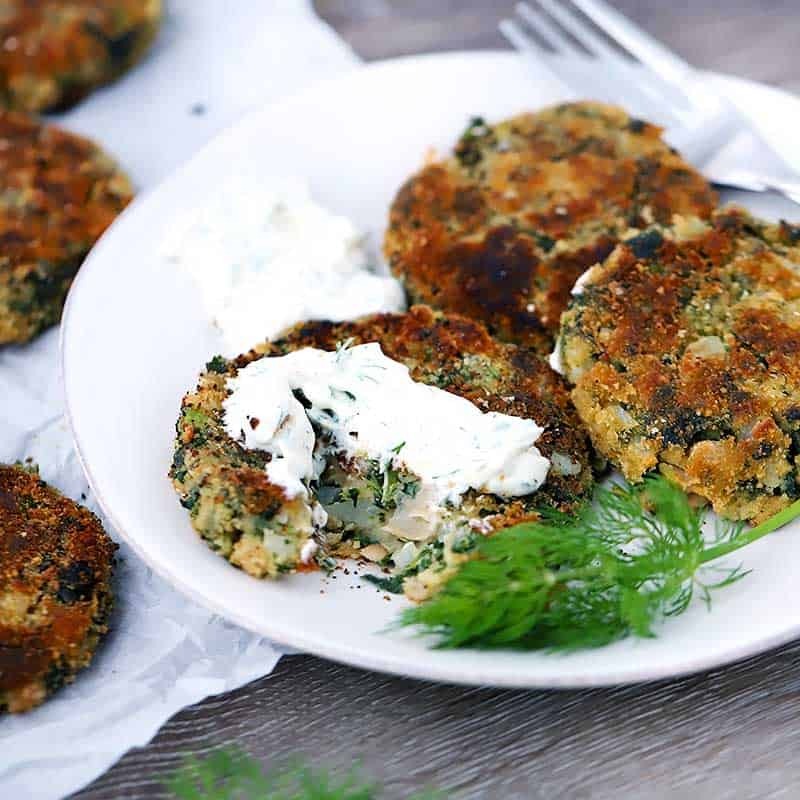 If you like these Spinach and White Bean Patties with Yogurt Sauce, you’ll love these Shrimp and Zucchini Fritters with Yogurt Sauce, these Quinoa, Mushroom, and Zucchini Veggie Burgers, and these Salmon Burgers with Lemon Caper Aioli. 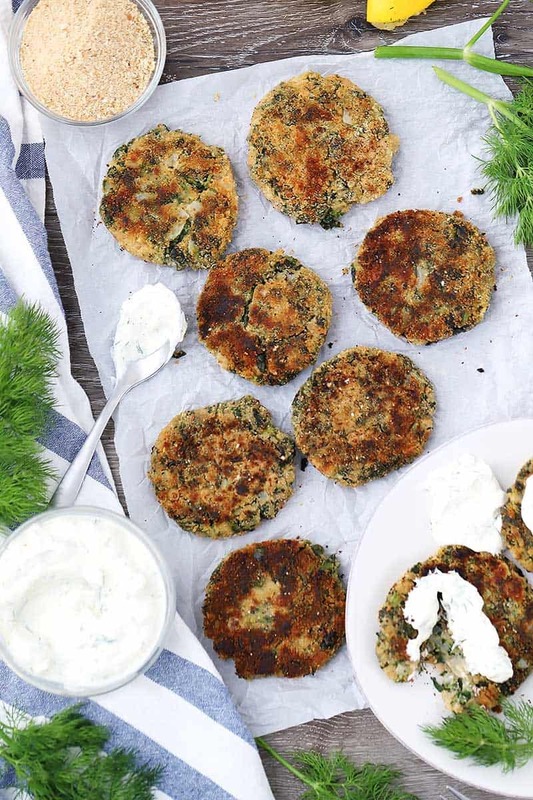 These vegetarian Spinach and White Bean Patties are a simple and delicious veggie burger served with a cool, creamy dill yogurt sauce. Put 1/2 cup of the breadcrumbs in a shallow bowl. Place the cannellini beans in a large bowl and mash with a potato masher, leaving some intact. Add remaining ingredients for the patties to the bowl and mix together well, using plenty of salt and pepper. Form 12 patties, each using just under 1/4 cup of the white bean mixture. Coat the patties in the remaining breadcrumbs. After forming each of them, I just pressed each side into the breadcrumbs and set them on a baking sheet until I was done. Heat the olive oil in a large heavy skillet over medium-high heat and line a large plate with paper towels. Add the patties in batches and cook for about 2 1/2 minutes on each side, until golden brown and crispy and cooked all the way through. Place on the paper towel lined plate. Meanwhile, mix together all ingredients for the yogurt sauce and set aside. 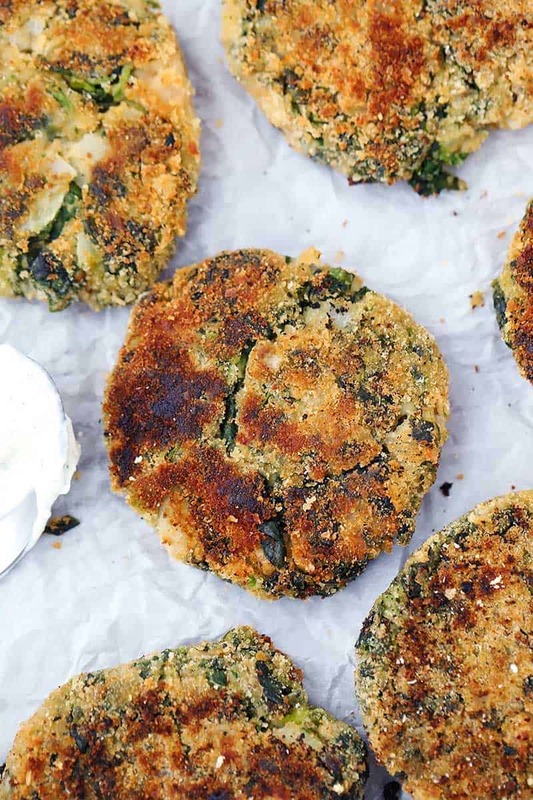 Serve patties immediately with yogurt sauce, or see notes for freezer instructions. After cooking the patties, you can freeze them. I recommend flash freezing them for 30 minutes on a baking sheet, then transferring them to an airtight container or zip-top freezer bag. They can be microwaved, baked, or pan-fried to reheat them when you are ready to eat them. I like to take out a couple at a time for a quick lunch for my toddler (and me!). The yogurt sauce can be kept up to a week in the fridge. Stir before serving, as it may get a little watery. You can form the patties to be double the size and serve as veggie burgers on a bun spread with the yogurt sauce, topped with baby arugula, sliced fresh tomatoes, and thinly sliced red onion as an alternative. Or, you can make them half the size and make mini patties for an appetizer. Elizabeth. Started making them yesterday, got to late to fry up so covered and put in the fright. Today, added two eggs, not one. They fried up in small patties after using the small baller and then pushing down gently with a fork. Other than the eggs, it was a perfect taste. We loved it recipe, however no yogurt sauce. I give 5 stars. Yes! Just cook it first a bit (I usually steam it) and then squeeze as much liquid out as possible. I also recommend chopping it up so the pieces are smaller in the patties. Hope that helps!